Hotel Tariff. Prices including full English breakfast. 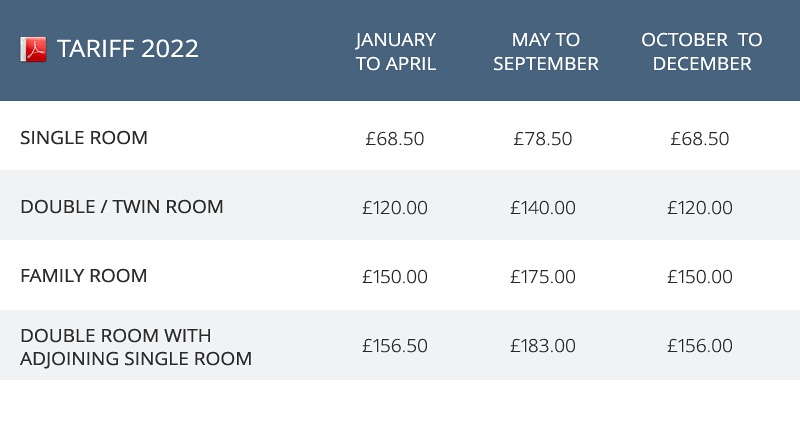 Hotel tariff prices per day per room including full English breakfast. Family Room for two adults and one child under 12 years consists of one full size double bed and one full size single bed. 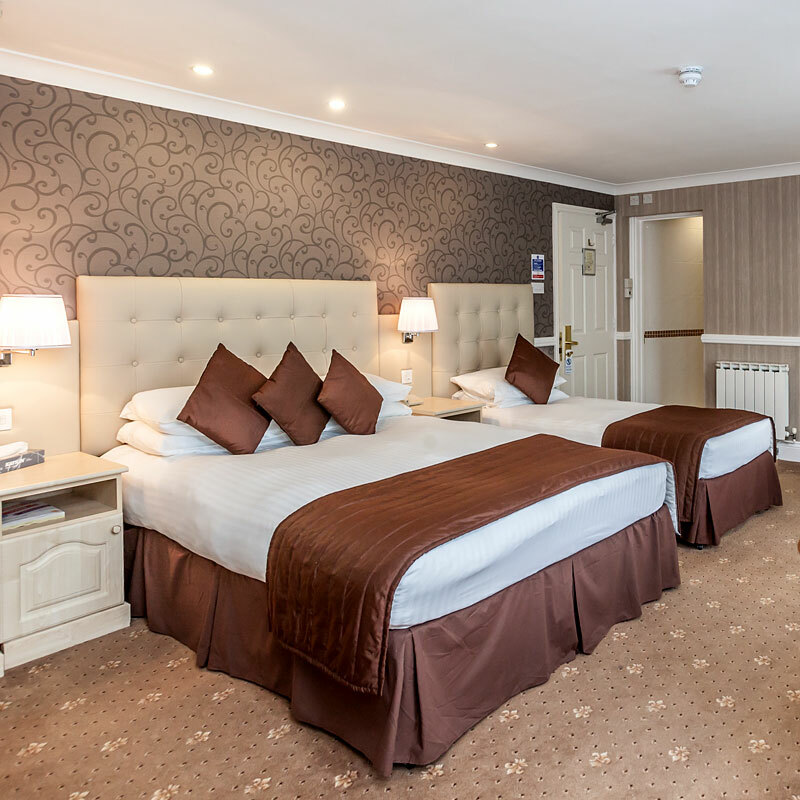 Price for double room with adjoining single room based on two adults and one child under twelve. A deposit of one nights stay (room rate), non refundable against cancellation. If accommodation is booked direct with hotel. In addition to the above charges are fuel costs charged at local prices on arrival. If Optional SCDW is not taken excess is £600.00 for KA/Fiesta and £800.00 Focus. All car hire charges to be paid direct to Hertz on collection. Please note there is a £8.00 supplement per day for automatic vehicles, available in Group B and C only. It is requested that all reservations are confirmed by letter or attached Reservation Forms. A deposit of one nights stay (room rate), non refundable against cancellation. Definite reservation only accepted on receipt of deposit, followed by our confirmation. We strongly advise guests to take out insurance against cancellation and late arrival or earlier departure than the period booked. 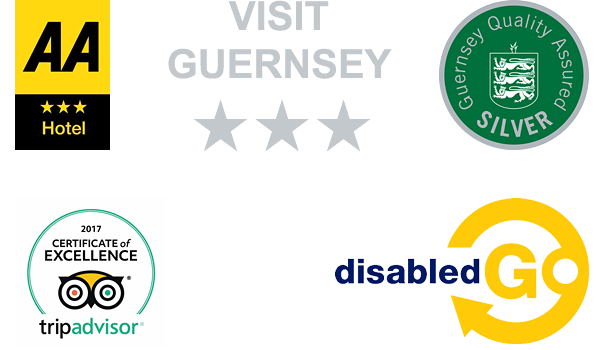 We thank you in advance for observing our non smoking policy in all of our rooms and public areas (Guernsey Law July 2006). We reserve the right to alter the tariff should this become necessary. The Restaurant is open to residents and guests at the following times: Breakfast 7:00 am - 9:30 am. Early breakfast can be arranged for early departures. Our popular bistro serves an interesting menu at very reasonable prices from midday until 2.00 pm and 6:00 pm until 9:00 pm. Packed lunches are made to order. Bedrooms are available from midday and whilst every effort is made to ensure this, it cannot be guaranteed. Rooms must be vacated by 10:30 am. Luggage may be left with reception for safe keeping. As residents you automatically receive a membership to our exclusive club. The Leisure Club is open from 6.00 am to 9.00 pm. During peak times access may be restricted. Last entry to the club is 8.30 pm. Children under 16 years of age must be accompanied by an adult at all times. In the interest of health and safety no child under the age of 16 is permitted in the gym area. Priority in our pool is for lane swimmers. There is no diving in our pool or use of inflatable toys, only inflatable safety equipment and training aids. There is a charge for the use of the Solariums. Take advantage of this great special offer and stay the night on us, absolutely FREE! This Guernsey hotel special offer is available year round to guests booking direct with La Villette Hotel. 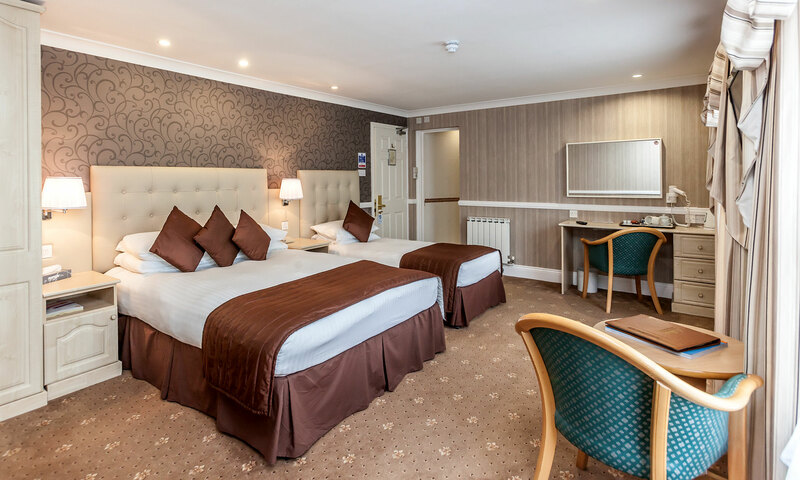 As one of Guernsey's premier Leisure Clubs, La Villette Hotel Health Spa offers you the perfect atmosphere in which to look after your body, relax, and most importantly, have some fun! For an invigorating start to the day or maybe to wind down after an energetic workout take the plunge in our 50ft Indoor Heated Pool. There are frequent daily flights to Guernsey from major UK airports and regular sailings by fast car ferry. See our useful list of online travel provider links.